This past week construction workers at the Wilshire Grand placed the final segment of the tower's rooftop spire, allowing the building to reach its final height of 1,100 feet and making the Wilshire Grand the tallest building west of the Mississippi River. Workers used a crane to lift the final piece of the steel spire and the building's beacon onto the building's roof. Once in place, the beacon on top of the 294-foot and 9-inch spire was wired for operation. The placement of the spire is the latest major milestone in the $1 billion project and brings the Wilshire Grand one step closer to redefining the skyline in Downtown. Construction began with a record-breaking concrete mat pour in February 2014 and is on track for completion in 2017. "The Wilshire Grand is an iconic building--and the addition of its signature spire today marks an incredibly exciting moment for the project and for all of Downtown Los Angeles," said Chris Martin, CEO and President of A.C. Martin, the firm responsible for the building's design. "In completing the spire today, we're celebrating a major accomplishment and getting a glimpse of the Wilshire Grand's bright future, which will redefine what it means to work, live and stay in Downtown Los Angeles." "We are proud to be working with each of the trade partners and individuals who are helping to bring this building to life," said Brendan Murphy, Vice President at Turner Construction Company, the general contractor responsible for the building's construction. 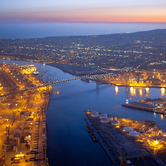 "We have come a long way in the construction of one of the most iconic buildings in Southern California, and I'm thrilled to celebrate another major milestone in the construction of Los Angeles's newest landmark." "The Wilshire Grand is an important part of the economic resurgence that is transforming L.A.'s skyline and has created 122,000 new jobs across our city," said Mayor Eric Garcetti. "I congratulate the project team on reaching this milestone, and look forward to seeing the tallest building west of the Mississippi open its doors next year." "The Wilshire Grand is not only the tallest building in the West, it's an entertainment destination that will represent the very best of what Downtown Los Angeles has to offer," said City Council member Jose Huizar, who represents the Downtown area. "I am pleased to welcome this important milestone to our DTLA community and the City of Los Angeles." 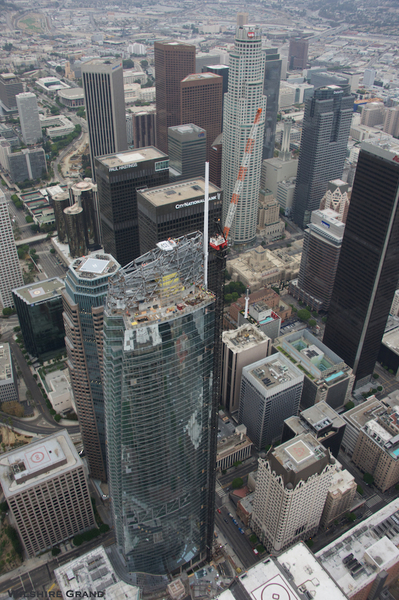 The Wilshire Grand Center stands 73 stories tall and is approximately 85 percent complete.